The Alps are home to some of the best road cycling routes in the world. We’re sure the 3.5 billion worldwide viewers of the Tour de France are in agreement. Here at Rush Adventures we’ve got all the local knowledge you need to plan your routes. 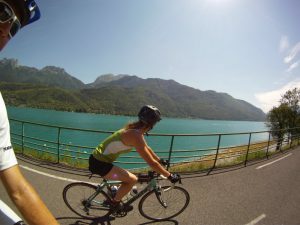 Whether you’re new to road cycling, or you consider yourself an experienced pro, our base in Les Gets gives you access to some truly memorable challenges. Our chalets are packed with maps and suggested route plans and sometimes we’ll even join you ourselves! Hire a bike locally, rather than invest in expensive kit for your first road cycling jaunt and have to worry about transporting your bike by plane or car. We have a good selection of road bikes available to rent here in Les Gets. The one piece of kit you should invest in is a pair of Lycra padded shorts. Attempting to get to grips with road cycling whilst wearing anything else is just madness. A good level of general fitness is required, especially up here in the mountains. We recommend endurance and cardio preparation exercises before your first road cycle challenge. Here are some great fitness preparation tips. (http://www.bicycling.com/training-nutrition/training-fitness/core). Don’t feel that you have to complete a long ride each day. Take time off between rides to rest and relax and enjoy some of the other outdoor activities on offer during the summer in Les Gets. From Les Gets, take the road towards Taninges until you see a sharp right turn. Here you’ll commence the steep climb towards Praz de Lys. The first turning on your right marks the start of a gradual climb up the Col du Encrenaz. At the top you’ll find stunning views. The descent takes you through the pretty hamlet of Essert Romand, from where you pick up the road to Morzine and the climb back to Les Gets. One of the areas most famous Tour de France ascents, it’s great fun to tackle this climb in the opposite direction. Head from Les Gets to Morzine and Montriond, passed the lake and into the Lindarets goat village. It’s here that the climb starts to get interesting, with a 9% gradient. The views from the top are well worth it. 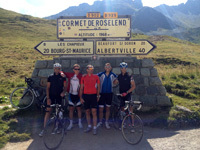 A fast descent down the Route de Avoriaz into Morzine, then climb back to Les Gets. 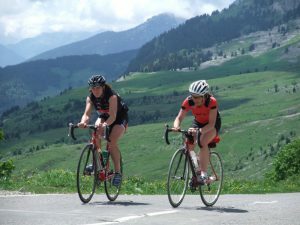 Descend from Les Gets to Cluses then take the route towards the charming villages of Le Grand Bornand and Saint Jean de Sixt before climbing over the Col des Aravis and descending into Flumet. Then follows a narrow and winding climb towards Megeve then a brilliantly fun descent all the way back to Cluses and the route back to Les Gets. As road cycling gains pace as one of the best ways to develop general fitness levels and achieve personal challenges, a number of specialist riding resources have popped up online. We really recommend using the Bikemap website to research your routes, using the experiences of others to get the most from your holiday. We’ve lived in Les Gets for over 10 years and we know the area very well. We know the importance of having a planned route for a day in the saddle and we’ll help you every step of the way. We have support vehicles available for longer more challenging rides and we know plenty of local riders (French and British) who would be happy to accompany you on rides. We also know the importance of nutritious, re-energising meals and in our catered accommodation options you’ll find that our meal plans are designed with your activities in mind. Tour du France: Every two to three years the Tour du France comes through the alpine villages of Les Gets / Morzine. 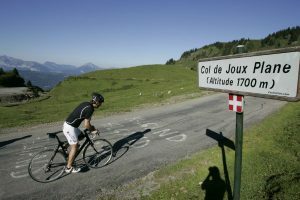 The tour last came through the village in July 2010 when they had a section finish in Avoriaz and an overnight stop in Morzine. The atmosphere was electric and due to the big road cycling climbs around here there are several fantastic viewing points where you can see the professional cyclists working hard climbing up and descending at huge speeds.